Winter is already knocking at our doors with its cold air and low humidity levels. The cold weather is all set to steal the moisture from our skin. And so once again dry and itchy skin, dehydrated patchy lips and dandruff in hair, all our winter nightmares are ready to threaten us! A healthy skin care routine that will surely give you a glowing and nourished skin all day. So here’s how you can welcome the winters with a healthy smile. Rub some fresh milk cream on your lips and massage for a few minutes. After about 10 to 15 minutes, wash with warm water. 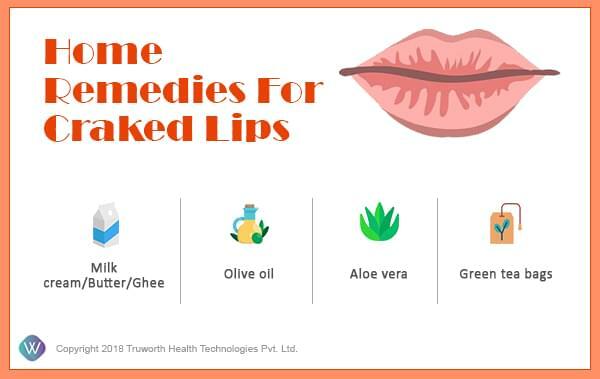 Do this twice daily to help your lips stay pink and soft. Mix together one teaspoon each of olive oil with any other essential oil of your choice, such as tea tree oil or grapeseed oil. Using a Q-tip, apply this over your lips and leave overnight. Do this every day for better results. Extract some gel out of a freshly cut aloe-vera leaf and apply directly onto your lips. Do this two times a day for better results. Dip a green tea bag in hot water for a few minutes. Once cool, place this tea bag over your lips and leave it on for few minutes. Wash with water and follow with a vitamin E enriched-lip balm. Apply freshly extracted Aloe Vera gel over the affected areas and leave it on for a few minutes. For an extra boost, add a few drops of vitamin E oil to the gel before applying it. Wash it off with warm water and then follow with some petroleum jelly. Mash an overripe banana and keep it aside. Next, add one teaspoon each of honey and olive oil, and mix well. Massage this onto your hands and feet in a circular motion for 5 to 7 minutes. Then, wash it off with lukewarm water. Follow with a moisturizer. You can use it daily on even the most sensitive parts of your body. These include the area underneath your eyes and around your mouth. Another advantage of coconut oil is that you don’t need to mix it with anything. Coconut is gentle enough for substantial everyday use. 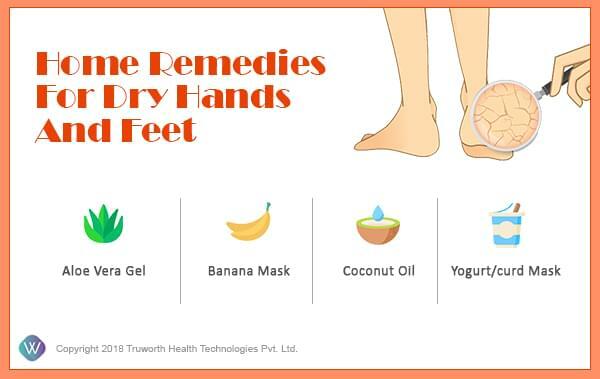 For a cheap alternative to that high-end cream, try coating dry feet and hands in full-fat yogurt. The lactic acid in yogurt acts as a natural exfoliant to gently remove dead skin while the fats restore moisture. Drink enough water, at least eight to ten glasses through the day to keep yourself hydrated. Avoid taking frequent hot water showers. Instead, bathe with lukewarm water. Keep a hand cream in your handbag and use it through the day. Before going to bed, apply foot cream or petroleum jelly. Cover your feet with socks. Avoid washing your hands and feet with harsh soaps and cleansers. Stay away from sanitizers and wet wipes containing alcohol. So, what are you waiting for? Try these useful remedies and tips mentioned above and happily say hello to winter!